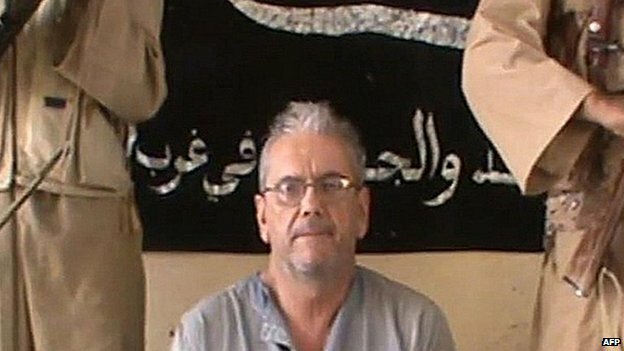 Islamist militants in Mali say a French hostage who has been held captive since 2012 is dead. The group, linked to al-Qaeda, told the French AFP news agency that Gilberto Rodrigues Leal “is dead, because France is our enemy”. So far there has been no official confirmation of the 62-year-old’s death. Last week, French troops in Mali freed five aid workers kidnapped in the north of the country in February. The report of Mr Rodrigues Leal’s death came in a brief phone call from Yoro Abdoul Salam, a spokesman for the Mujao Islamist militant group, AFP said. He gave no details on the date or circumstances and when asked for evidence, he said “in the name of Allah, he is dead” before hanging up. The office of French President Francois Hollande said Mr Rodrigues Leal probably died several weeks ago because of abusive treatment by his captors. A statement said France would “do all to uncover the truth… and will not leave this unpunished”. The French foreign ministry said that the statement from Mujao “responsible for his kidnapping, leads us unfortunately to believe today that Mr Rodrigues Leal is probably dead, even though no material proof can allow us to confirm it”. On Sunday, French Foreign Minister Laurent Fabius said he was “extremely worried” about Mr Rodrigues Leal. “We haven’t had any news for a long time. We are in contact with the family but we are extremely worried,” he said. Mr Rodrigues Leal was kidnapped in November 2012 by armed men near the western town of Kayes as he was driving a camper van from Mauritania. Mali descended into chaos two years ago when a Tuareg rebellion in the north triggered a military coup. This allowed Islamist militants to take over territory which they held for nearly a year until French and West African forces intervened. Posted on 23rd April 2014 by newsafrica. This entry was posted in Africa, al Qaeda in Africa, Christainity, Democracy, France, Human Rights Violations, Islam, Mali, Religion, Terrorism. Bookmark the permalink.